"Out of the fog...out of the night...and into his American adventures...comes...Bulldog Drummond." British Army Captain Hugh "Bulldog" Drummond became a Private Investigator after WWI. Along with his devoted assistant Denny, Bulldog battled the criminal element over the air waves for almost ten years. 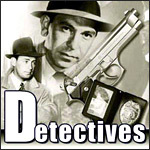 Most of their assignments, some of which had wartime overtones, were murder cases. Although Bulldog always got his man, this tough and two-fisted detective was a bit of a sucker for the ladies! Both George Colouris and Ned Wever played the title role.